As we saw, the Bible teaches that the rainbow is a sign of God’s covenantal promise never to destroy the earth by water again. 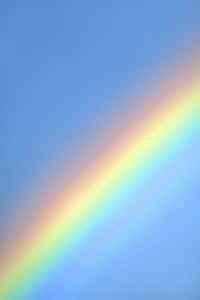 Sure, thanks to science, we now know that a rainbow occurs when sunlight is both refracted and reflected in drops of water, dispersing the light at various angles. Light enters a raindrop at one point, is reflected off the back of that drop at another, and leaves at another, creating the colors that we see. Poet John Keats feared that science would unweave a rainbow, but even if we could parse, measure, predict, and quantify everything about a rainbow down to the innards of each photon and the underbelly of every quark, what would that prove other than that we understand better the natural laws God used to create the signs of this covenant promise? Science might one day be able to explain everything about how rainbows are made-even to 25 digits to the right of a decimal point-but it can never explain why they are made. We, though, know why. Because God created our world in such a way that when sunlight and mist are in right relationships to each other, the mist breaks up the light by refracting and reflecting it at different angles that create bands of electromagnetic waves which, when reaching our eyes, imprint the image of rainbows in our minds. And He did it (the why that science can never explain) to remind us of His covenant promise that never again would He destroy the earth by water. What are some other crucial truths, revealed by the Bible, that science can never teach us? In fact, could you argue that the most important things we know could never be revealed by science? If so, what truths would they be? In class, go over the crucial relationship between faith and works in the plan of salvation. That is, what is the role of faith, and what is the role of works, and how do they relate to the Christian experience? What does it mean to say that the law is engraved on our hearts? How does this idea show the perpetuity of the law, even under the New Covenant? 1. The existence of such unsearchable truth reveals the Divinity of its Author and the vital importance of faith. 2. Faith is a chosen response to the evidence of God's goodness, grace and exceeding great and precious promises. To become familiar with these evidences leads to a decision, faith being one of two possible responses. Works are what is accomplished through either faith or unbelief, being a result of either accepting "the power of God unto salvation to everyone who believes" or the alternative works of the flesh which is weak and erring. The fruit of the Spirit produces works of righteousness in the daily life of the surrendered soul. The choice of faith remains ours to make, and will always involve taking up one's cross. 3. The Law engraved upon the heart is from being "strengthened with might" by the Holy Spirit by which Christ Himself dwells in our heart by faith. He is the living law and works through the willing human agent. This is accomplished as described in Ps 1:1-3. When the Law is engraved upon the heart, every thought, word and action is inspired by and in harmony with it.